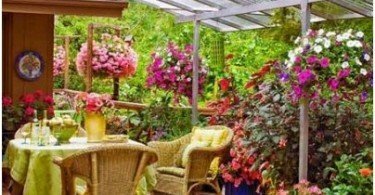 Many of us live in private homes are cottages,therefore all know the feeling when you want to sit seems to be in the room, but to the fresh air, aromas of flowers and singing birds - you are no drafts, but not stuffy. Because very often these very private and summer houses can be seen veranda. 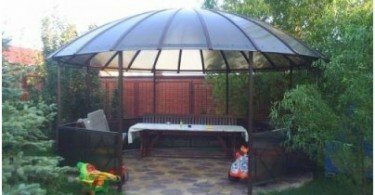 To prevent hypothermia family, resting peacefully in the open air, we know what to cover a floor on the veranda to a pastime not turned into a disease. Veranda - a closed extension to the house, whichusually built under the attic. Veranda is often not heated, which is why the question of what it strewn floor, relevant. It is stupid to close for the winter months this room only because of the cold - it is better to equip it with the mind and enjoy the pleasant atmosphere all year round. In connection with our pretty cool and, in addition, climate variability often glaze veranda with three or at least two sides. This room is constructing or wood, orthe same material as the main part of the house (brick, concrete slabs, etc. Cbit). Thus, these structures are not rigidly linked as the weight of the massive walls of the house and porch vary significantly. That, in turn, threatens to drafts and really icy floor, and it is - one more reason to seriously think about the fact of what your floor is made on the veranda. Since the foundation will differ by platformfloor needs special attention - it must prepare itself to nastilkoj flooring. Topsoil removed, zemelku horoshenechko aligned (to the grass did not germinate under the floor). 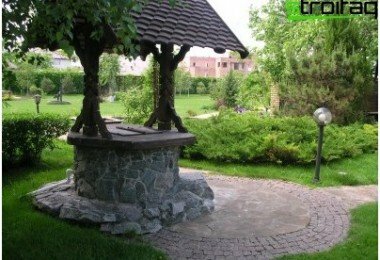 Sometimes it is recommended to cover the ground after its herbicidal alignment film, and then fix the dense layer of gravel or crushed stone. 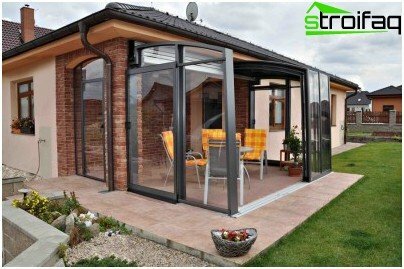 However, your site for future porch should be more than just a flat, and have a slight slope towards the drainage holes or drainage ditches. What will be your cover on the floor of the porch, and ofwhich it will be done depends on your preferences, the proposed budget that you are willing to invest in its annex, and, of course, on your imagination. 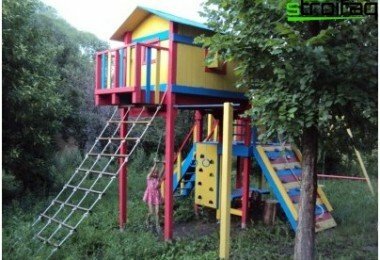 Fortunately, manufacturers now offer a huge range of materials with varying density and color etc. Consider the most popular and cost-effective design options. 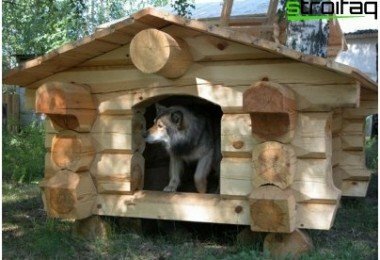 Wood is the unconditional winner amongMaterials for the floor in all kinds of outbuildings, it occurs almost in every second country house, almost in every dacha, even in the private sector within the city. On the verandahs, the pads are covered with dried and well-planed planks with a smooth surface (the side should be at least facial - it looks more decent). 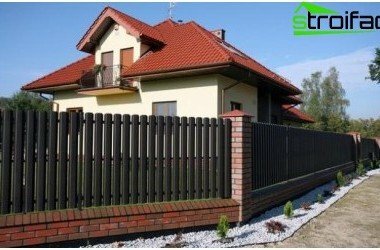 The thickness and width of the boards can vary significantly depending on the area, the presence or absence of voids beneath them (between the soil and by the coating), and some other factors. soak your wooden floor bioshield funds or special structure on the basis of lacquer, can be covered by a pre-tinting agents - so the floor will last longer. Helpful advice: Try to lay out the board so that the annual rings on wood "watched" in different directions with respect to the plane of the floor. So your coverage from time to time gaining moisture from the rain, is not so obvious is deformed and bent. 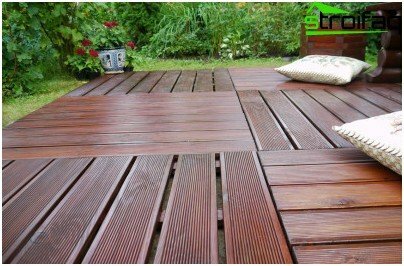 Decking - the same wood (called the materialeven decking board), but treated in a special way. This floor is more resistant to the processes of decay, non-slip and durable. 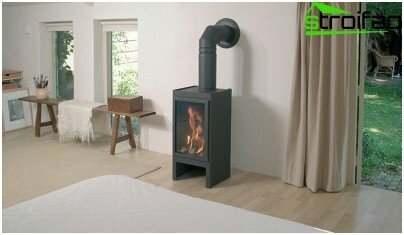 Do it from a large range of species, from the ordinary to the exotic tiger larch wood. Another advantage - this floor does not need regular emulsions reducing treatments. The second option is preferable - it is easier to use, easier to move around on it and slipping almost impossible, even if a floor is wet. Installation is carried out in the open and hidden way. In the first case covering elementary prisverlivayut to lag screws (in the very boards before assembly is necessary to make holes, to cover not cracked in progress). The second option - laying decking on a special fixture. Bonds in place on the board and connected to saw through metal plates, it is desirable that it was a plate with antirust coating. 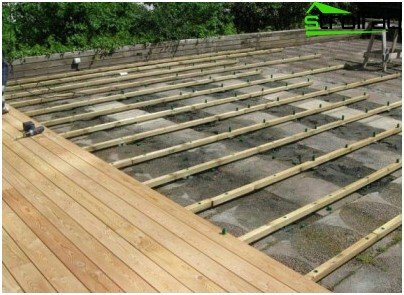 Important: decking requires ventilation, take care of the gaps between the planks so that air can circulate freely between them. After laying unpack their gender protective varnish to prevent burning and damage appearance. Ceramic and porcelain tiles plitochki - alsoa very popular choice for a floor on the veranda. 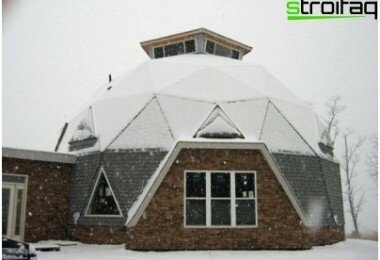 If you choose the kind of frost resistance of the material, the floor is durable, attractive, plus behind it will be extremely easy to care for. Area under annex poured sand or cement mortar. The solution is spread to a width corresponding to the number of rows in which you will lay plitochki (its value depends on the width of the tiles themselves). Razrovnennaya surface littered with cement. We spread plate pristukivaya and pushing it into the ground. After a couple of days to process the seams well jointing mixture for loyalty. Voila - effective solution for the decoration of the porch ready. Tip: make cement-sand base at least 20 mm in width, but the joints between plitochki too big should not be. Contents base veranda using PVC - meansget a modern durable floor without much fuss. Beautifully and quickly. The choice of textures, colors and manufacturing technologies pleasing to the eye, purse and also gives space for flights of imagination in you sleeping designer. Then you and imitation stone, parquet floors and laminates, PVC and do "under the tile" - distinguished, there beneath his feet, only to the touch. 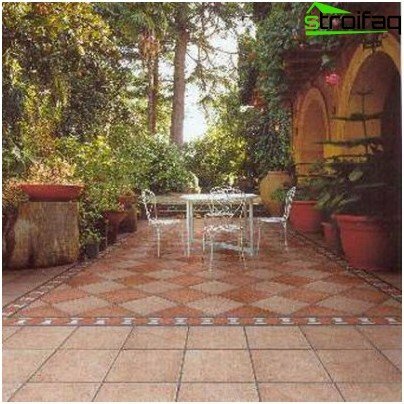 The beauty of this floor is that it is not necessary to specially prepare. The soil is leveled and gruntuem. Mark up the transverse and longitudinal axes of the future verandas. From the point of intersection of the axes defined "dry" decompose PVC. Pasted by coating the edges of the transverse axis, moving from the center of the little room next to the walls (you can glue on spec. Mastics, synthetic glue). Recommendation: tiles will stick better if the sticker after it properly pass a special roller or a heavy object at worst. It also follows that all plitochki were at the same level, it affects the quality of your performance and comfort of your household in the further use of the veranda. Linoleum is laid typically placed on a fabric base. After 2-3 days neprokleennye of the linoleum cut, under the joints do prokladochki from scraps of plywood or fiberboard (for strength, so that the coating does not ride up when walking and lie flat). Do lapping of 1-2 cm, leaving not glued to 8-10 cm with a panel on the perimeter of the site. Sticking carefully pressed linoleum to the surface, so that no air bubbles are not crept in, otherwise the coating will swell and then go tubercles - as ugly. Mazhem floor cold bitumen mastic, waiting for half an hour - and you can start gluing. Linoleum Cloths stack of boxes - in the direction of light. Then - the removal of dirt and dust. The platform is spread - we have already remembered, right? 24 hours before the start of work, we expand the rolls so that they leveled, and it was easier to work with them. Choosing the material for the soul and pocketbook. After trimming the gaps between the walls and the cloth is closed plinth. That's the whole list of the most common solutionsfloor on the veranda in our climatic conditions. Choose what you like, but do not forget that by using the majority of these coverings, you need to take care of an additional floor insulation. Let you be comfortable on your porch.